Great War Wednesday: Fear God and Dread Nought | "Granny Beads and Grocery Store Feet"
HMS Dreadnought under full steam. Every now and again something comes along so amazing, so revolutionary it causes a break in time. Much like Christ’s life, death, and resurrection divided history into BC and AD (or the more politically correct BCE and CE) an event or an invention splits our paradigm where everything gets sorted into before this event and after this event. In naval history, one of those history dividing moments came 10 February 1906 with the launch of HMS Dreadnought, the most modern and revolutionary battleship in the world. In our modern era of overwhelming air power and its projection via aircraft carriers, we don’t think much about battleships anymore, but from the 1500s until 1920s, any country who wished to project power abroad did so with capital ships. Now to give a full history of naval design developments would take much longer than I have to write and you have to read so let me hit the high points. From the 1500s through the American War Between the States of 1860-1865, the primary weapons system of fighting ships anywhere in the world was basically the same: one or more decks of the sailing ship were lined with smoothbore cannon. The accepted tactic was for enemy ships to approach one another at ridiculously close range and blast away at one another until one combatant was reduced to splinters or sank. For nearly 400 years, sail and smoothbore reigned supreme. Then came the aforementioned American War Between the States and four nearly simultaneous leaps forward in technology. Leap one was the decision to fasten metal plates to the wooden sides of ships, nascent armor. Leap two was the introduction of steam power and the removal of sails, cutting the umbilical “wind cord.” Thirdly, the rifled cannon came into prominence enabling gunnery at huge distances. 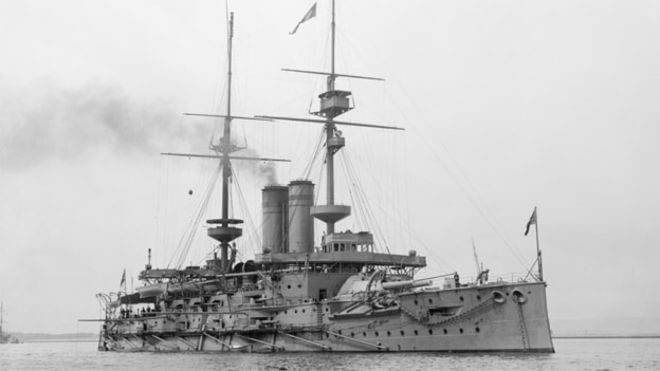 It was the fourth innovation that would later set HMS Dreadnought apart forty years later. A little ship called the USS Monitor made her debut in the Battle of Hampton Roads Bay. She was ironclad, steam driven, and mounted rifled cannon. What was most interesting about her, however, was in an era where some ships carried 100 cannon, she only mounted two, but they were rifled and housed in a contraption called a turret. The turret rotated to give Monitor a 360 field of fire. She didn’t have to wait to come broadside of an opponent; she only needed to turn her turret to gain a shot at a target. Now, turrets didn’t catch on all over the world overnight. Capital ships, especially battleships, continued to mount their main armament in broadsides with one or two turrets to assist the broadside but these turrets were mounted on the sides of the ship so their field of fire was limited. Battleships also carried several types of guns in different batteries throughout the topside of the ship. Each of these guns required its own special type of ammunition. It was not an efficient system by any stretch. HMS Goliath, one of the “pre-Dreadnoughts” replaced by the all-big-gun design. Notice the secondary battery amidships. Then Sir Jacky Fisher became First Sea Lord of the Royal Navy. He set down plans for a battleship with all big guns. Specifically, he wanted a massively armored ship mounting 12 inch naval rifles. Such a craft would be able to engage targets at the heretofore ridiculously long range of 14,000 yards. Royal Naval engineers went to work and the fruits of their labors was the paradigm changing HMS Dreadnought. When she launched, Dreadnought was the most heavily armored ship in the Royal Navy and, by extension, the world. Despite her massive armor weight, she was also one of the fastest capital ships in the world with a sustained top speed of 21 knots. This speed was due to her innovative steam turbines, the first to be used in the Royal Navy. What set Dreadnought apart most of all, however, was her main battery. She was the first battleship in the world that did not mount any heavy guns in static positions. Her main battery consisted of ten guns in five turrets of two guns each. Three of these were mounted down the centerline of the vessel, a first for battleship design. The other two turrets rode amidships, one to starboard and one to port. Unlike later “super-Dreadnoughts” which followed along soon enough, none of HMS Dreadnought’s turrets were stacked one atop the other, a situation called “superfiring.” Although superfiring turrets would be de rigeur for all later battleships because of the superior field of fire thus available to all guns, at the time of Dreadnought‘s launch, no one was sure what would happen if a pair of 12 inch guns from a superfiring turret fired over a lower placed turret. One fear was the resulting muzzle blast would blow back into the lower turret and harm that turret’s crew. Upon her launch, HMS Dreadnought made every other battleship in the world obsolete. She was much faster, possessed greater armor, and completely outgunned anything else on the high seas. Admirals and other naval officers the world over began referring to their present battleships as “pre-Dreadnoughts” and the struggle began to build Dreadnought style battleships in other countries as well, especially the newly consolidated German Empire. In a way, Dreadnought helped bring about the Great War simply by her existence. All the other major naval powers had to start building their own new type battleships or risk falling perilously behind in technology. This started a major arms race all over the world. Germany in particular had long been jealous of Great Britain’s naval might and so embarked on a fool’s errand to duplicate the size of the Royal Navy. This escalation of the arms race lead to increased tensions between the two countries, tensions that later boiled over with several other factors to cause the First World War. Ironically, the battleship that epitomized the class for the modern era never actually fired her guns in anger. The only clash between Great Britain and Germany’s battleship fleets was the famous Battle of Jutland in 1916, but at the time, HMS Dreadnought was in Scapa Flow being refitted with the latest technology. She never got into the war and ended up sold for scrap less than two years after the war to end all wars ended. One of Dreadnought‘s most famous descendants, the USS Iowa, which served in WWII, Korea, Vietnam, and Desert Storm firing her full main battery. As I understand it the reason why the British didn’t install superfiring gun mounts in HMS Dreadnought was because the spotting hood (where the fire-control guy stuck his head) was at the forward end of the gun-house. Firing tests showed that he’d be concussed by blast if the mountings were superfiring. Some of the early Dreadnought designs actually suggested them anyway – the ship went through a whole panoply of variants before the final design was settled on. Weirdly, the US equivalent, USS North Carolina, was designed at exactly the same time WITH superfiring gun-mounts. But that was because the US system was different. British construction times were amazing, so Dreadnought was in the water first.